From the kitchen of One Perfect Bite...Pokhara is a small Nepalese city tucked into the foothills of the Annapurna range of the Himalayas. Things, including time, move slowly here. Cars are not yet a problem, television transmission is intermittent and the air is fresh and clear. While the area tries to keep a low profile, 100,000 travelers arrive here every year. 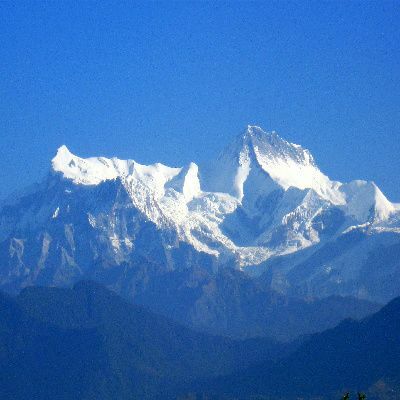 The city is a mecca for climbers and trekkers who account for 80% of its visitors. The area is also a retirement haven for Gurkha officers whose presence, coincidentally, keeps the crime rate low and the economy healthy. Those who come are charmed and pampered. Many stay. Hence, I can happily report it is possible to get fabulous pizza in the foothills of the Himalayas. The old city is much like the Kathmandu of my imagination, but accommodations are first-rate and are a welcoming place to train for, or recover from, strenuous outdoor activity. Part of the daily panoply is watching helicopters evacuate trekkers who have underestimated the toll that altitude will take on their bodies. Most recover poolside and still have the time of their life. 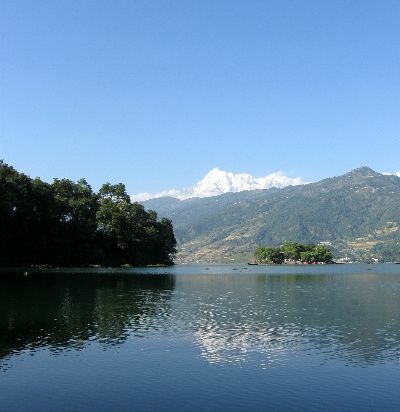 I was completely charmed by Pokhara and its residents. 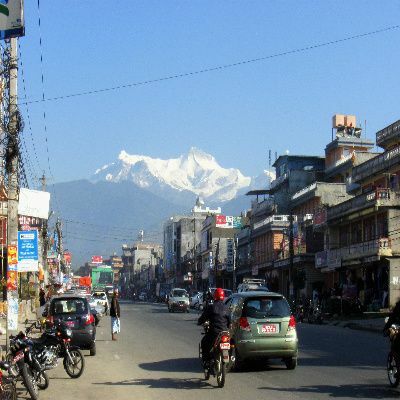 If you are lured by the unusual and enjoy back roads and byways, Pokhara will enchant you as well. In Nepal there's a entree called a Nepali set. It is an assortment of dishes arranged on a plate especially designed to feature each component of the meal. I'd like to take you through those components a step at a time and, today, we'll start with the two most basic elements of the dish. Rice and lentil are the staples of the Nepali people. They are eaten twice a day in a dish that's called Dal Bhat. The dish may be supplemented with curried vegetables, called Tarkari and pickles, but rice and lentils are always part of the meal. They will also appear on our expanded versions of the Nepali set that we'll build a step at a time. Here is the recipe for the rice and lentils that form the base of the Nepalese diet. 2) To prepare lentils: Wash lentils and soak lentil for 10 minutes. Remove anything that floats and drain. Place lentil in fresh water and bring to a boil. Add all spices. Reduce heat and simmer, covered, for 20 to 30 minutes until lentils are soft and have the consistency of oatmeal. In a small pan, heat remaining butter and fry onions, chilies and garlic. Stir into lentils a few minutes before you stop boiling. Serve with rice. The snow covered mountains are breathtaking! I enjoyed visiting Shangri-Lla with you this morning. Coincidentally, I am planning a pot of lentils today. Instead of the usual, I'll use your recipe sans ginger paste which isn't currently in the pantry. Mary, u enjoyed India totally and thoroughly, and u make see India sooo beautifully , totally !! I love how u connect each post of the place and food together! I love traveling there with u,imagine u relishing this and thinking ,boy she really did make the best despite the hiccups!! Love this Dal Bhat, have heard about it too! I wish I was there..it sounds totally charming...fancy having a pizza in that little sweet town! Such a comfort recipe luks delicious...Beautiful Pics. What gorgeous pictures, Mary! I've always wanted to find my Shangri-Lla...little did I know I could find it right here on the internet! It sure looks delicious and exotic. The photos as always travel you away. I can almost smell the cold air from those mountains! Got a chuckle out of your response..."my Pilgrims had lemon pie!" I've been considering lentils today! But it is not the lentils that draw me in - oh those Himalayas - what sights you have seen. How much you can appreciate! (And love that there's a pizzeria - how fun). Another interesting dish and your pictures are gorgeous! The photos are stunning! 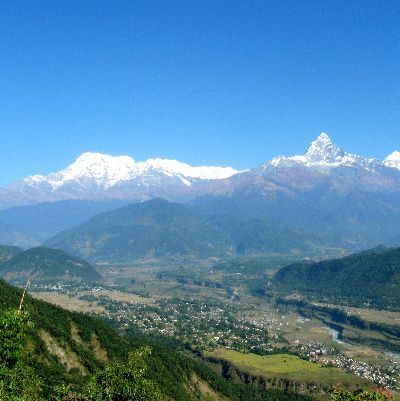 I think Pokhara sounds like my type of place to want to visit. First rate accomodations and all that beauty and a slower pace of life- sounds delightful. I'm sure the lentils are too. Sounds like a wondeful part of your trip! Stunning photos! We love basmati rice and lentils so this would be great for us! That first picture leaves me hungry, the rice so fluffy! What a beautiful setting. I tried to cook Basmati rice for the first time last week, without great success. I'll have to try again! What a beautiful dish. And we even have whole Indian lentils, call urad dal. And the photos - spectacular. I'm loving the combo of food, scenery, and culture you're putting in your posts. Napal is one of those places I always wanted to visit - you my inspire me to make the trip. Just the name 'Dal Bhat' brought a smile to my face... its a staple for us folks... dad has eaten it for lunch every single day for the last forty odd years :) I cannot deny I was a little jealous as well... lol... I was born there but you have seen more of India than I have so far. Great photos - love the snow covered mountains. I've never eaten a dishg like this but I am certain I would enjoy it . Your pictures are just gorgeous Mary! I love your travel tales. Those mountains are so very beautiful. I'm really enjoying the daily trip recaps. Keep them coming. You remind me of my experiences. I am a mountain girl really, when I see the mountains I feel good, i need to go up a little... I remember the planes in India, the heat, smells, noise, colours... then we moved to the Himalaya and i felt better. Even the poverty looked different in the mountains, I supposed that it is too cold to sleep out in the streets at night, mountain people needs to be more inventive, make a constant effort, leaving on alms alone would not be possible there. And then in Nepal also, the country is much poorer than India, and yet the poverty doesn't look the same in the eyes of the visitors. Sorry Mary, better stop now or I'll write for hours! I've done a search on your page but I wonder if you've ever posted any recipes for quinoa? Color me jealous re: your trip. I love that you have taken me on this trip to Nepal with you. Enjoying the local food is a wonderful way to peer into the culture and way of life. I learned a lot reading this post today. Thanks for sharing. Wow this trip truly looks amazing. What I would like to know was how you managed to post recipes while traveling. Now that’s dedication. Alison, the recipes that were posted while I was gone were made weeks before I left and time released according to a schedule I had established. I'm now back to one day at a time. Thanks for sharing your trip with us! I love the photos! And I could eat lentils and rice every day! The dish sounds great! Your pictures are stunning and amazing! The sharpness of the mountain peaks and the colors take my breath away, and I never knew about this place! How long did you stay? These vistas are breathtaking and the description of life in that village made me feel like I was there; It sounds lovely and welcoming and so beautiful. Love that dish, too. So beautiful Makes me want to go there. Beautiful pictures again!! Wow!! The lentils sound good too! Nepal sounds like such an interesting place! A little of this, a little of that. I am so excited to learn more about the culture since I truly don't know anything about it, and what better way than through food! I am really enjoying hearing about your trip, Mary. Your photos are gorgeous! The Dal Bhat sounds really good. Looks and sounds like a wonderful trip--the pictures of the children are just adorable. The tea sounds very interesting. It's hard to find recipes though! Thank you for this--I will definitely be trying it soon! Thanks for sharing your beautiful pictures. The ones of the mountains are inspiring. Mary, I am enjoying your posts so much but its making me get the travel bug!!!! Hi Mary, another charming post as usual. I did leave you a comment on my blog but I'm not sure if you'll have the time to be back there any time soon, so I'll write you something here aswell. I appreciate you coming back to my blog to visit and also leave a comment. I am now following your blog. 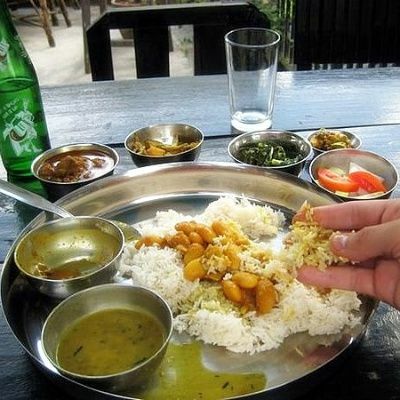 Such breath taking photos...wish I could visit someday, the simple Dal Bhat looks very healthy! Love the read, and the delicious Pakora recipe too, Mary. As everyone has already said...thank you so much for sharing your trip! It sounds like you saw some breathtaking sites, and experienced some amazing food and people. I love learning about how different cultures eat, and so I found this post particularly intriguing. I love lentils, and now I have a new recipe to try. Thank you for sharing. I hope the rest of your week is beautiful! Oh my, those photos are gorgeous! Just look at the view. Absolutely breath taking! I do wish to visit there one day. The food served there looks simple & healthy. Did you just mention pizzas??? 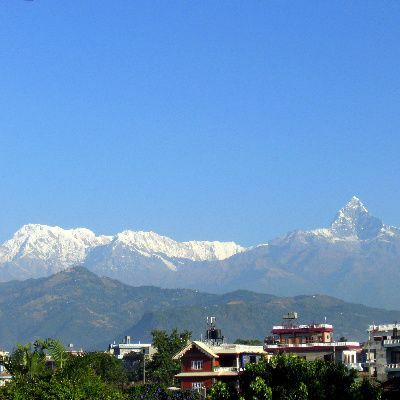 I think Pokhara sounds like my type of place to want to visit. First rate accomodations and all that beauty and a slower pace of life- sounds delightful. I love to have dal bhat, its really good food. thank you for sharing your experience. Obviously no doubt dalbhat is delicious food for every one.